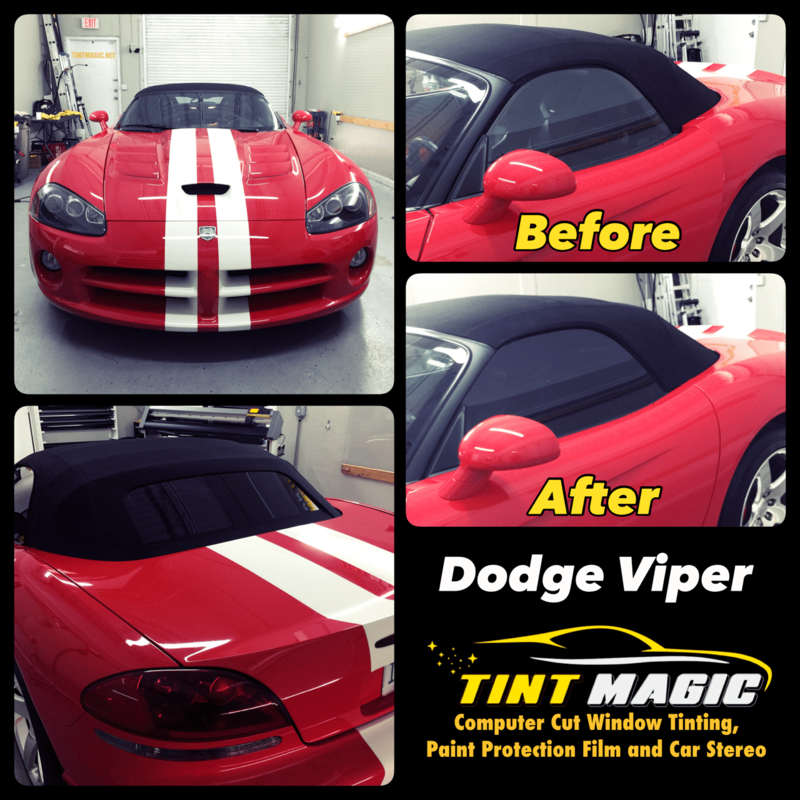 Dodge Viper at Tint Magic Window Tinting Coral Springs, Tamarac, Parkland, Boca Raton, Sunrise, Weston. We use advanced software to pre-cut window film before applying it over glass window. Call us for the best quality – Llumar, Suntek- and service! (954) 840-7883. The Viper is both all-American and a true exotic, with lots of curves and bulges in all the right places to let you know it means business. The long nose, bodacious body, and predatory stare give the Viper a menacing look, while its 645-hp, 8.4-liter V-10 can catapult it to 60 mph in about three seconds. For the ultimate track monster, check out the Viper ACR. With all kinds of aero aids, special tires by Kumho and carbon-ceramic brakes, Dodge says it is the fastest Viper on a racetrack. Truly unique cars are few and far between these days. Every manufacturer is finding new ways to share components. And most models’ color combinations are limited to shades of silver with tones of beige or gray inside. For now at least, the Viper carries on. Our newest test example wore a custom interior and paint designed by a guy named “Sneaky Pete,” or so says a badge on the dash. Mr. Pete chose a beautiful multidimensional silver paint and an all-red interior for this GTC model. But this car’s hierarchical place in the Viper pit is a little confusing. The GTC is above the base Viper SRT and the next-up GT and below the GTS model, but both the GTC and GT wear “GT” badges on their front fenders. To add to the confusion, Sneaky, as friends call him, added the GTS interior package ($8500), bringing a full leather cockpit. Does this make the car a GTS? No, not really. The Time Attack Group 2.0 package ($8700) was also fitted. So this is a TA 2.0, right? Not quite. True TAs are built on the base SRT and come with cloth seats and a plastic dash. The Time Attack Groups (both the 1.0 and the winged 2.0, like this one) include the majority of the TA’s go-fast bits—suspension, wing/spoiler, splitters, brakes—but not all of them. Two notables missing are the SRT hood (six hood vents versus the GTS hood’s two) and the carbon-fiber X-brace (a really fancy strut-tower brace that saves 2.9 pounds over the standard brace), although both of those were added back into this car, for $500 and $2800. It wouldn’t be totally incorrect to call Pete’s car the nicest TA 2.0 out there.